Materials Engineering presents the proceedings of the First International Symposium held at the University of the Witwatersrand, Johannesburg, South Africa in November 1985. The book aims to survey the historical development, the state-of-the-art and potential future directions of a broad range of engineering materials and processes. 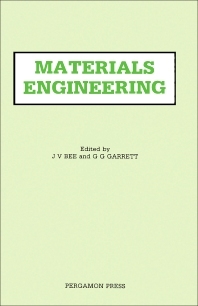 The text describes the materials for the 1980s and 1990s; the structure-property relationships in metals, polymers and composites; and the developments in engineering ceramics. Engineering ceramics; semiconductors; and the surface engineering of metals are also considered. The book further tackles papers on alloy development through microstructural design; welding processes; facets on fatigue; and corrosion-resistant materials. The text also encompasses nuclear techniques; the use analytical electron microscopy in materials science and engineering; materials science and engineering in South Africa; and hot working. The book will be useful to scientists, engineers and technologists involved in all aspects of research, design and applications of a broad range of engineering materials.